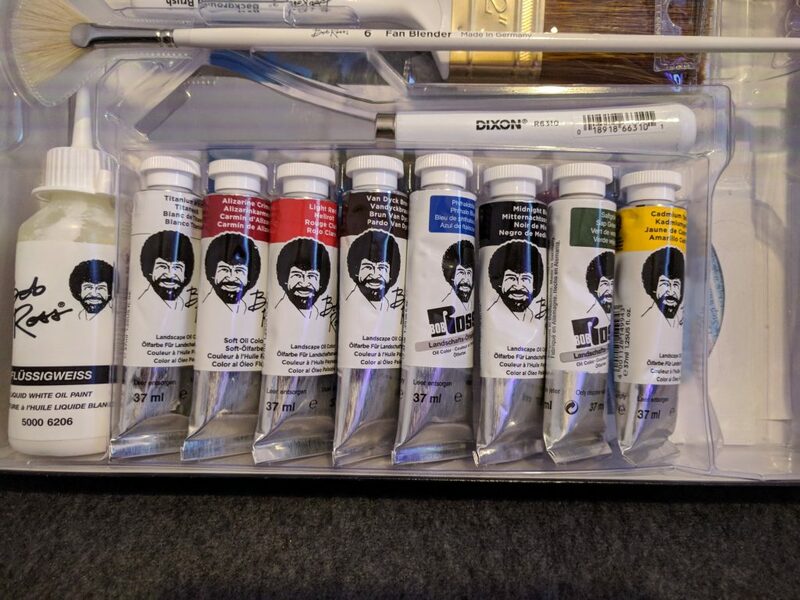 The Bob Ross Company makes several painting kits and sets that contain (almost) everything you need to paint with Bob Ross. Their flagship painting kit is the Bob Ross Master Paint Set and contains painting supplies which let you create almost any painting on ‘The Joy of Painting’. But is it really worth it? We bought one to give you all the information you need to help you decide for yourself in our Bob Ross Master Paint Set review. Is it worth it financially? How much do I save? 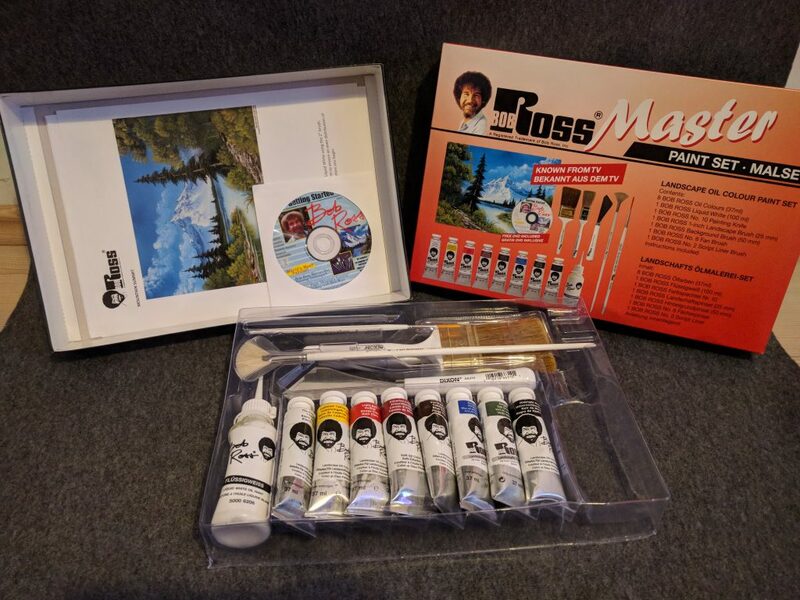 The Bob Ross Master Set contains eight tubes of paint (1.25 oz / 37 ml), four brushes, a painting knife, a bottle of liquid white base color (4 oz / 118 ml) and painting instructions for a painting, both on paper and on a one hour long DVD. It comes in a cardboard box featuring the typical Bob Ross aesthetic. We imagined it to be a bit bigger than it was, but with a size of 1.9 x 14.9 x 11.7 inches (4.8 x 37,9 x 29,7 cm) there is more than enough room for its content. The painting kit we are reviewing features text in English and German since we ordered it from a European marketplace. Inside the carboard box we find a plastic inlay that holds the Master Set’s content and secures it from moving around during transport. There is some empty space on the right side of the inlay which looks like it would hold some kind of bottle. After some research we found that there are special versions of the Bob Ross Master Set that contain an additional small bottle of paint thinner. Underneath the plastic inlay we can find the instruction folder and the Getting-Started DVD. All Bob Ross brushes are natural bristle brushes made from animal hair and shaped to Bob’s own specifications to work perfectly with his wet-on-wet technique. The tools come with a handle painted in white and three of the brushes have a protective plastic wrapping. They also have a very nice weight and feel a litte heavier than other tools we have used before. All these things make the products feel very high quality and nice to use. As mentioned above these two brushes are made from natural bristles and the very first thing we noticed when picking them up was their almost absurd thickness. These brushes really pack a ton of very dense bristles. The thick round handle and the brass metal feel very well made and nice to hold. Since these brushes are designed for Bob’s wet-on-wet technique we now understand why our clouds and brushes never came out half as good as Bob’s own. The high amount of bristles allow the brush to pick up a lot of paint. The length and thickness enable you to paint fluffy clouds and happy bushes with very little pressure. 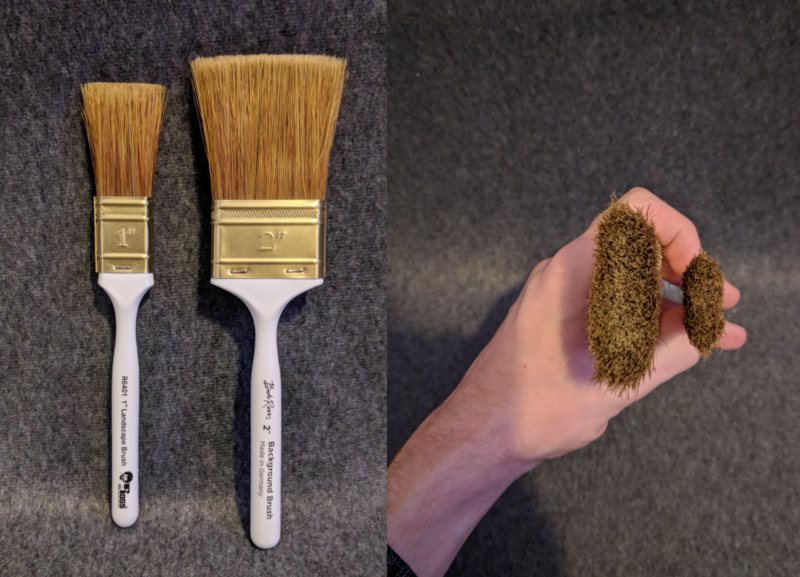 Comparing the Bob Ross two inch brush to another brush we have used before really shows how specialised these tools are. Below you can see the difference in thickness and length. The other brush is a standard natural bristle two inch brush for oil paint. The difference really is extreme. We’ve often been frustrated when painting bushes because the shorter, thinner (and therefore stiffer) brush didn’t allow us to paint with the amount of freedom that is needed for best results. And since this review wouldn’t be complete without a video of a finger going through the brush here it is. Just an amazing feeling. Another stable in Bob’s toolbox is the fan brush. He uses it to make clouds, folliage, waves and to put highlights on grassy hills and evergreens. Just like the other brushes this one is made from natural bristles. It is a #6 fan brush, meaning that it is the larger one of the two variations made by the Bob Ross Company. The other one is smaller and called the #3 fan brush. Again we have a nice protective sleeve for the bristles themselves and a round white handle with a nice weight to it. This time we have silver metal parts instead of brass. Bob Ross often mentions how important it is to have well made tools because of their superior characteristics. One of the most important of these characteristics for a fan brush is a certain ‘springiness’. It is especially important when painting trees. For Bob’s method you have to put quite a bit of paint on your brush when painting evergreens and then use the edge of your brush to paint the limbs. If your fan brush is not firm enough you risk that the heavy paint clogs up your brush and makes painting the next limbs harder. 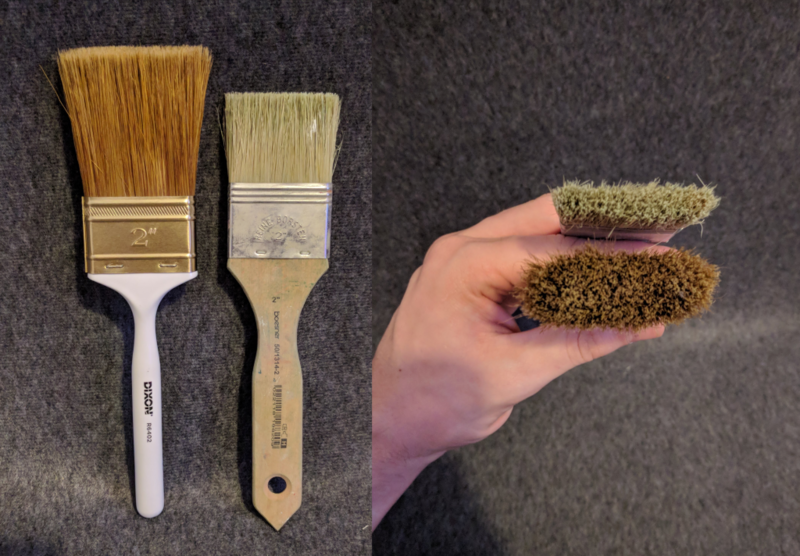 We did not have any problems like this when doing our trees with this brush as it always jumps back in its original form even when using a very thick coat of paint. The Liner Brush is the last brush we take a look at. Bob uses it in every painting even though often only to sign his name. Besides that it is used for thin limbs and sometimes blades of grasses on beach scenes. Just like the other brushes we have natural bristles on a nice ergonomic white handle with silver metal again. The bristles on this one have a nice length to them that gives you a certain freedom and makes for very nice curves. To finish our collection of tools we take a look at the #10 Painting Knife. Just like with the fan brush ‘#10’ means that it is the larger of two knifes, the smaller one being the #5. Bob uses the painting knife mostly for his almighty mountains, altought there are paintings that he does with knife only. The knife itself feels rather heavy. This makes it a great tool for when Bob tells you to use the weight of your knife to put snow on your mountain tops. We have used plastic painting knifes and non Bob Ross knifes before and their light weight makes it hard to apply the highlights when doing mountains. 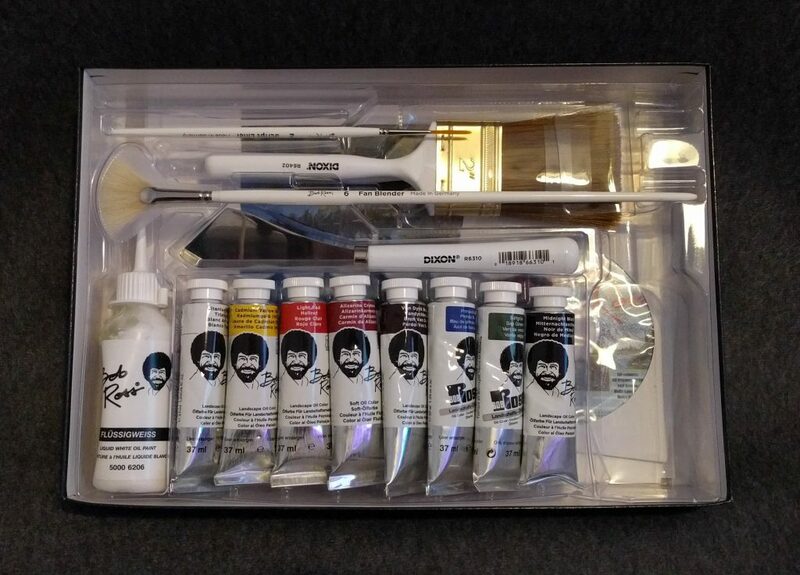 The Bob Ross Master Paint Set contains eight tubes of oil paint and a bottle of liquid white. The tubes contain 1.25 oz / 37 ml of paint. Seeing these medium sized tubes was a nice suprise since we somehow expected to find only small tubes with 0.4 oz / 12 ml. (Despite reading the product description beforehand.) Most of these medium size tubes cost around $10 on Amazon.com. With the Master Paint Set’s price being around $100 it really is a good deal. But more on that later. These eight colors let you paint a lot of Bob’s typical mountain paintings. As always with Bob Ross oil paints the lighter colors have a different oil-to-pigment ratio than the darker ones. Remember: thin paint sticks to thick paint. This makes painting highlights on trees for example way easier than with ‘normal’ oil paints. The bottle of liquid white contains 4 oz / 118 ml of liquid white, which should last for quite a few paintings. Along with the 1.25 oz / 37 ml tubes the paint included should let you paint at least 3 to 5 paintings without using up one of the tubes. Maybe more if you are carefull not to waste paint. 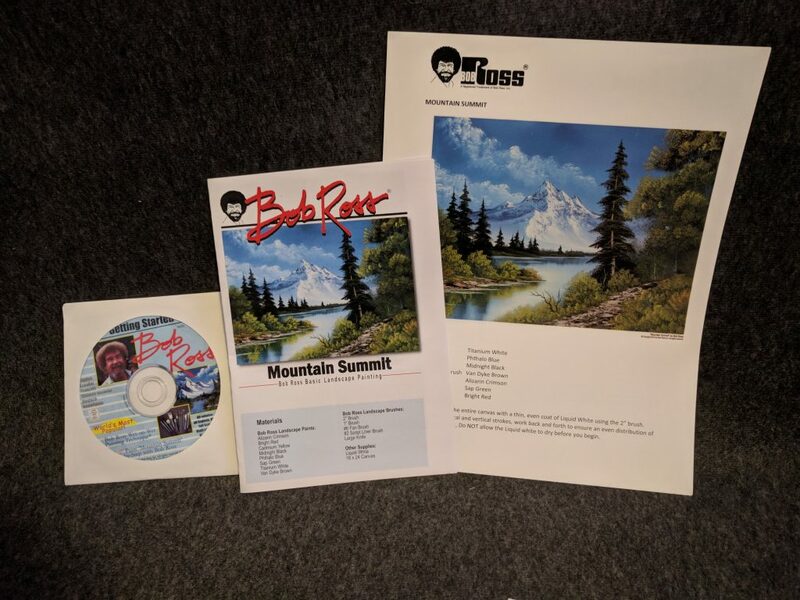 The painting kit contains instructions for a painting in the typical Bob Ross style called ‘Mountain Summit’. There is an hour long DVD for you to paint along, as well as two booklets. One repeating the instructions and one with additional tips. Since we have been painting for a while we can’t really say anything about how easy it is for beginners to follow along, but we asked someone else to test it for you. Adding up these numbers we arrive at $91.95 for the tools. So getting the Master Paint Set is almost worth it for the brushes and the knife alone! As mentioned above one of the 1.25 oz / 37 ml tubes of oil paint costs around $10. Since we have eight of them this puts us at $80 for the tubes and an additonal $12 for the liquid white. (Since you can’t buy a 4 oz bottle we just halved the price for the 8 oz one.) So we get another $92 for the included paints. Since there is a special one hour episode for beginners available for free on the internet we don’t put a price on the instructions. Buying all contained items separately sets you back $183.95. 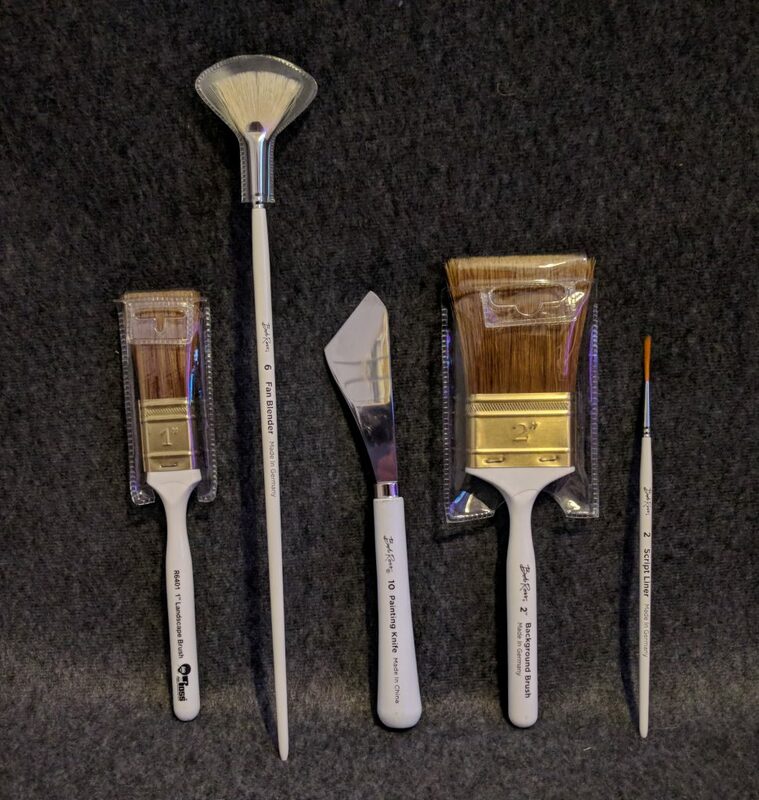 With the Bob Ross Master Paint set priced at a maximum of $110 on Amazon you save $73.95. Most of the time you can get it for $100 anyways, saving you almost $85. Canvas: You need a pre-stretched and primed canvas of a good size. We suggest the Arteza Canvas 18×24”. While any canvas will do for starters we found that it is worth it to spend a few bucks extra to not get the bottom shelf ones. Paint Thinner: Used to clean your brushes and thin your paints. No need to get expensive ones, we suggest the Mona Lisa 32-Ounce Odorless Paint Thinner. Be sure to get the odorless one! Easel: While not really necessary (you can mount your painting to the wall or a ladder) it makes everything way smoother to work with. We have a cheap aluminium one from Amazon. While not the most stable one it does its job perfectly. We think the Bob Ross Master Set is a great way to start painting. It gives you high quality tools and paints made specifically to work with Bob’s wet on wet technique for around $100 and even with the needed additional purchases (canvas, paint thinner and easel) it enables you to start a new and exciting hobby for as little as $150 without having to get low quality supplies. We hope you give it a try and it gives you as much enjoyment to paint along with Bob Ross as it does for us. Thank you so much for your helpful review. i ABSOLUTLEY loooove this review!! It was like having someone who cares about me enough to explain the needed details a novice not only would want to but SHOULD want to know!!! Thank you sooooooo much! I once heard specificity is the basis of cooperation. I am now ready to purchase based on this AMAZING REVIEW. I rec’d a Master Paint Set which contains all items listed above, but the 4 oz (118ml) bottle is labeled “Odorless Thinner”, and is NOT Liquid White, as depicted on the box. Is this common? Will I still need Liquid White, a separate purchase? Where do you get and what does his palette cost? Since the Master Kit is geared toward those just starting with the Bob Ross technique, you’d think a palette would be included. Since Bob liked to mix his colors right on the palette, he used an oversized one to have extra room to do so. Since the kit includes brushes, knife and oils all specific to Bob’s style, the lack of a palette seems to be an oversight. The master kit that I just received for Christmas in 2018 has script liner brush made in China and the #6 fan brush is also made in China! I do have a #6 fan brush made in Germany that I also received for Christmas! The China fan brush hair is poor and cut uneven, but the Germany fan brush is just perfect. I wondering if they are trying to cut cost? But the China version just feels cheap and inferior! !